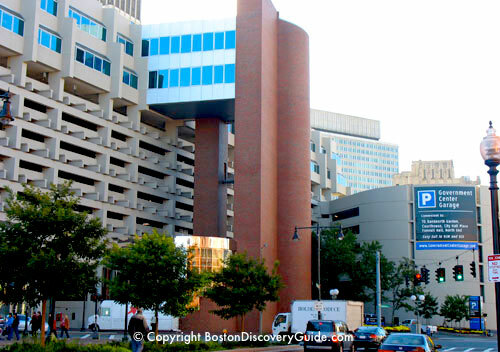 Boston parking garages near North End attractions, TD Garden, Faneuil Hall Marketplace, and the Aquarium are life-savers if you must drive and park in this part of the city. If you've ever tried to find on-the-street parking here, you know how scarce it is. 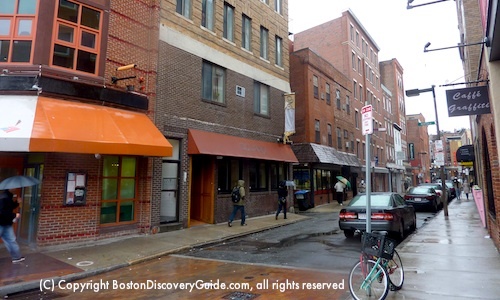 And most available spaces along the narrow streets are Boston permit parking spaces marked "North End Residents Only." Even if you find one, overstay your metered time by just a few minutes and a ticket will appear on your windshield. Or even worse, you might get towed. So a parking garage or lot can actually save you a whole lot of money and trouble. 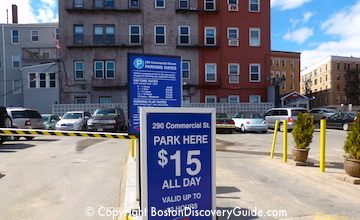 The good news is that you can find cheaper parking rates near the North End than in nearby Downtown Boston - especially if you use "early bird" strategies, discounts, parking lots, and especially if you're parking for events, avoid the most expensive options. 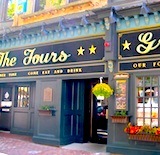 Of course, you can take the T . . . several stations (North Station, Haymarket, and Aquarium) are conveniently close. The T almost always provides the cheapest and most convenient way of getting around Boston if walking isn't an option. Another good strategy is to drive almost to the city, but park at Sullivan Station - less than a 5-minute T ride to North Station. And to get the absolute cheapest parking, head to the small Patriot Parking lot across from Sullivan Station - more about that in a moment. However, if you must bring your car, try these Boston parking garages in and near the North End. 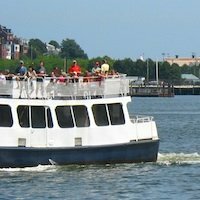 They are convenient to TD Garden, Faneuil Hall Marketplace, Haymarket, the New England Aquarium, and Boston cruises departing from Long Wharf and Rowes Wharf. Not sure what's where? Check this map of parking garages listed on this page. Please note: Although we provide rates for comparisons, Boston parking rates in some garages and lots change frequently - so do check garage websites to verify rates if you're trying to get the best deal. 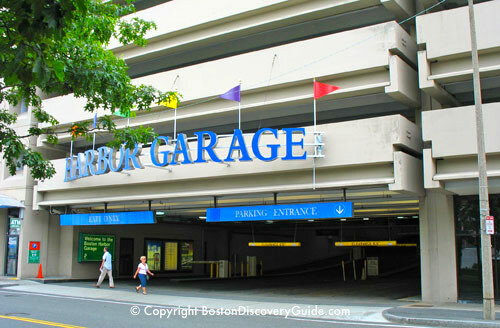 Although the Boston Harbor Garage is one of the most expensive Boston parking garages near the North End if you use the regular daily rate, it does offer great convenience and amenities. Especially in bad weather or if you're taking your young children to the Aquarium or IMAX Theatre, both of which are just a few steps away, you'll appreciate how close it is. Entering the garage, you can insert your credit card in the machine rather than taking a ticket. Then when you're leaving, just insert your card again to pay. The garage also offers free battery starting and tire inflating / changing services. You can also get your car washed and detailed onsite. 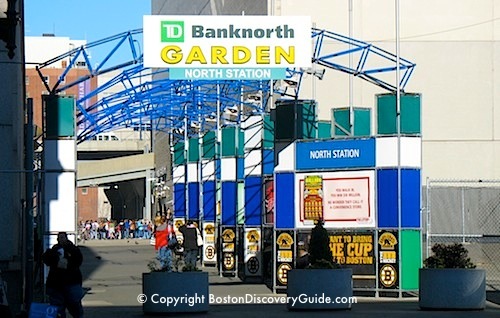 If you're going to an event at TD Garden, the North Station Garage will be your most convenient option, if not the cheapest. The MBTA owns this garage, but recently leased it for 75 years to the Bruins. Look for the addition of retail shops and a second entrance/exit onto Legends Way and Causeway Street in a few years. 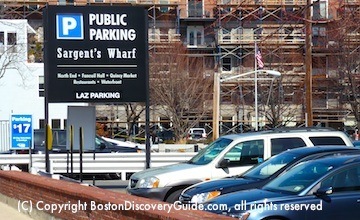 Near Lewis Wharf and Sargent's Wharf, you'll find a cluster of 3 parking lots and a garage that usually offer attractive (and sometimes competing) rates - the best cheap parking in Boston's North End. Parking lot rates vary depending on the day, time, and season, so your best bet is to either drive by or even call them in advance and inquire. They may also be higher for special events. Because the lots and garage are close to each other, you can pick whichever one appears to offer the best price. You can see the locations of these parking lots on the North End Boston parking map at the end of this page. Often the cheapest of the 3 lots in this area, as spaces are tight - find a spot close to the entrance for easiest parking. Read the signs carefully because they're sometimes confusing. But even if you miss a detail, you're usually sure to get cheap North End parking here. Getting in and out of this underground garage is easy, and rates are similar to the nearby parking lots. NOT a 24-hour garage - so be sure to note closing times. 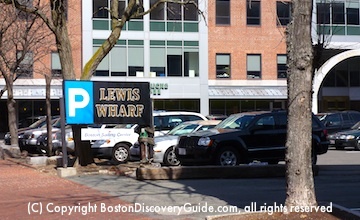 Best bargain at Lewis Wharf Parking is the $15 rate for 10 hours or less. Parcel 7 Garage - Cheapest Parking Garage in Boston . . .IF you have validation! Parcel 7 Garage is not Boston's newest, cleanest, or sleekest garage, and the ramps are kind of steep . . . but it's really, really cheap (if you shop at Haymarket), really, really convenient, and in my opinion, one of the best parking bargains in Boston. How cheap? Would you believe only $3 for up to 3 hours? Here's the catch - you have to have your ticket validated. 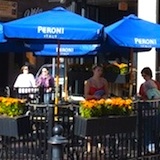 But no worries - lots of North End businesses, including ImprovAsylum and most restaurants, validate. I've never seen a comprehensive list - so call your destination, and ask if they validate for Parcel 7. Best bet in a pinch: Adam's Pizza & Convenience Store at the corner of Hanover and Blackstone will validate with any purchase. Unfortunately, even though Parcel 7 qualifies as an "insider's secret," there are plenty of "insiders" . . . so sometimes it's full. If you plan to park at Parcel 7, always have a #2 choice in mind. Address: 92 Sudbury Street (but use 110 New Sudbury Street for your GPS, and when you're returning to the garage to get your car, use Stairwell 1 on the Hanover Street side across from Bell in Hand. 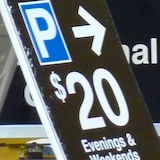 Bargain rates with validation: $1 for up to 2 hours parking, $3 for up to 3 hours . . . but regular rates kick in for over 3 hours. Daily parking rates: Starts at $7 for 20 minutes hour or less. $30 for 1 hour 40 minutes or less. $35 maximum daily rate. Evening/weekend rates: $11 if you enter after 5pm and exit before 5am Mondays - Fridays. $11 all day on Saturdays and Sundays. Not valid during Garden events. Government Center regular daily rates are high . 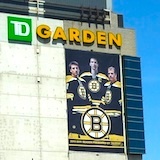 . . but attractive for evening and weekend parking, and competitive for TD Garden event parking. Plus, if you love mid-century modern and Brutalist style architecture, you'll be parked right in the middle of it. Daily parking rates: Starts at $9 for 20 minutes hour or less. $28 for 1 hour or less. $38 maximum daily rate until 5am. Evening/weekend/holiday rates: $18 if you enter after 5pm and exit before 5am Mondays - Fridays. $18 all day on Saturdays and Sundays. 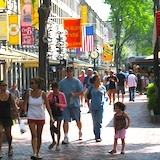 $3 discount with validation or a discount coupon from participating Faneuil Hall Marketplace stores and restaurants, as well as many other clubs and restaurants in the area (although some give only $2 discounts); take your parking ticket with you. Daily rates are high, even with a $3 discount available at participating Faneuil Hall Marketplace stores and restaurants, and many area restaurants and bars; Harborside Inn guests receive a 20% off discount. After all, this is the Financial District - but evening and weekend rates are reasonable, especially with the discount. Use this map to find Boston parking garages near North End attractions and other favorites in the area: Faneuil Hall, Quincy Market, Boston Harbor cruises, the New England Aquarium, and TD Garden. This map shows the Boston parking garages near North End attractions that are reasonably priced or offer discounts or cheap prices at certain times. Some of the parking lots are fairly small, and at times, all of the garages and lots fill up - so do take the T when at all possible! To save money and possibly time, drive to the Wellington Station T station on Route 16 in Malden or the Sullivan Square T station in Charlestown. Both are just north of Boston, with MBTA parking lots. Your trip on the Orange Line to North Station from Wellington will take only about 5 minutes, and barely 3 minutes from Sullivan Square. Although these parking lots fill up with commuters on weekdays, you'll find plenty of parking for evening and weekend events. Currently, you can park here for $6, and the round trip T fare on your Charlie Card will cost under $5, or under $6 if you need to buy tickets. 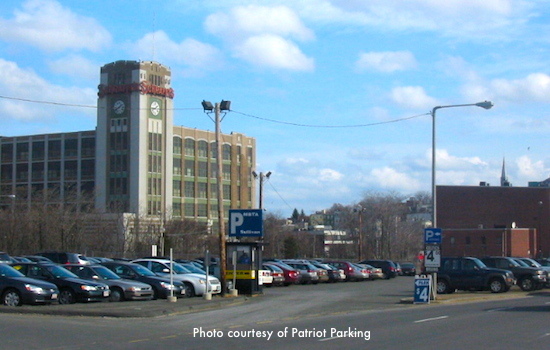 To save the most money on parking for TD Garden events, park in the Patriot Parking Lot across from Sullivan Square Station in Charlestown. This 200-space lot, located at 5 Maffa Way, offers a $5.00 rate after 1pm on weekdays and all day on Saturday and Sunday - perfect if you're going to a Bruins or Celtics game, or a big concert at the Garden. Commuters park here in the mornings when the Sullivan Square T Station lot gets full, but it seldom fills up, plus it begins to empty out by mid-afternoon. If you don't happen to know where it is, you can easily miss it, especially if you are not in the left lane. To park here, head south down I-93 toward Boston. To get off at Exit 28, take the ramp on the right for Mystic Ave toward Sullivan Square / Charlestown. In about 0.5 mile, take the ramp left for Broadway toward Boston via Charlestown / Sullivan Square - stay in the far left lane as you head toward the underpass because in a few seconds, you will be able to pull into Patriot Parking on the left. In about 0.2 mile, the road name changes to Maffa Way. 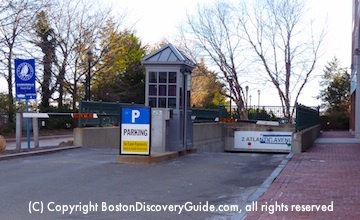 As soon as you go under the underpass, you can see the entrance to Patriot Parking on your left, across from the Sullivan Square T Station - exactly what you see in the photo above. Once you park, all you need to do to get to the T station is to cross the road - sometimes easier said than done, as traffic here can be fast assuming you avoid rush-hour gridlock. The safest way to cross is to walk to the traffic light at the intersection with the rotary - about a 1-minute walk. Please note: We do our best to make sure the information on this page is accurate, but it may change at any point without our knowledge. Please be sure to confirm all details ahead of time. 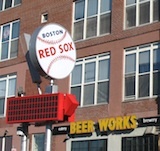 Boston-Discovery-Guide.com makes no representations or warranties with respect to any information, materials, or graphics on this website, all of which is provided on a strictly "as is" basis, without express or implied warranty of any kind. Copyright © 2008- 2019 Boston Discovery Guide. All rights reserved. Content (including photographs) protected by DMCA.